Ted Naos has designed a number of paper cut graphics for such prestigious institutions as The Art Institute of Chicago, The Museum of Modern Art, The Solomon R. Guggenheim Museum, The San Francisco Museum of Modern Art, The Museum of Fine Arts, Boston, and The Smithsonian Institution. He has donated several designs to Unicef. Most recently, Ted has designed die cut skyline fold-outs of New York City, Chicago and San Francisco. He also came out with a large three-dimensional Kinetic Sculpture Calendar which has been 'in the works' for years. He has developed multi-image desktop calendars, a color game and puzzles using the same principals of design, dynamic composition, variety, unity, dominance and contrast. 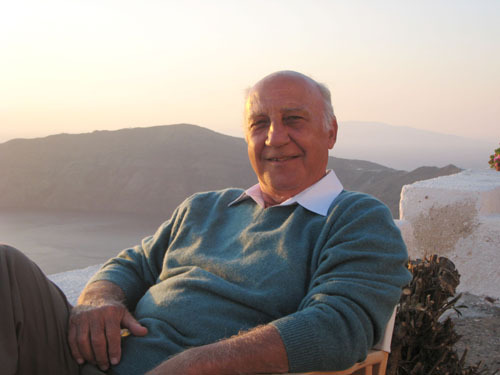 Born in Athens, Greece, Ted came to the United States to study architecture at the University of Texas at Austin followed by Columbia University in New York. After graduation, he worked for SOM Architects and Edward L. Barnes Architects in New York City. Some years later Ted moved to Washington, D.C. to join the faculty at the School of Architecture and Planning at the Catholic University of America. As Professor of Architecture, and later Professor Emeritus at CUA, he taught design for many years while also pursuing his professional practice and his passion in painting and three-dimensional graphics. The three-dimensional images are die-cut one at a time by machine, hand stripped, hand assembled, and hand folded in Baltimore, MD, USA. Beautifully crafted, cut from recycled paper, these exquisite, elegant designs are enjoyed the world over.